Product Condition: The R5B Uomo Boa Shoe - Men's is in Good condition. These Uomo Boa bike shoes have been slightly used by the previous owner and are in good condition. There are scuff marks from the cleats of the previous owner attached near the forefoot area and various scratches throughout this area as well. In addition, there is a small dirt scuff on the inside of the left side of the heel of the left shoe. Aside from all of the previous use, the dialed laces and Velcro straps are in perfect working order. The shoes' insoles and rest of the upper are also in great shape. As a final note, these R5B Uomo Boe Shoes are the ONLY items being sold with this, there are no additional cleats or screws for attaching your own cleats. 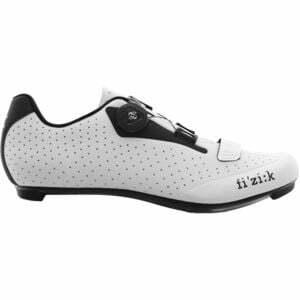 While the Fizik R1 Uomo shoes are some of the most comfortable, high performance shoes weâ€™ve worn, they may be a little pricey for riders who want comfort but who arenâ€™t rolling to that start line on a regular basis. For this reason, Fizik introduced the R5 Uomo Boa Menâ€™s Shoes. While they arenâ€™t sewn from kangaroo leather, the R5 uppers are highly breathable Microtex fabric with nylon mesh windows for ventilation. Inside of the uppers is Fizikâ€™s Superlight Insole that supports your arches and absorbs road vibration. The uppers are placed on a carbon-reinforced nylon outsole that allows efficient power transfer while remaining on the lower end of the carbon cost spectrum. The stack height is low and the outsole is engineered to drive power to the pedals while remaining flexible enough for comfort on long rides. A molded heel cup helps to keep your foot in the ideal pedaling position while minimizing heel slippage. To secure the shoes to your feet, the R5 Uomo use the Boa closure system. Consisting of a single dial with a continuous loop, it is micro-adjustable for the perfect fit. A hook-and-loop closure at the forefoot adds a separate adjustment point to keep your toes happy.